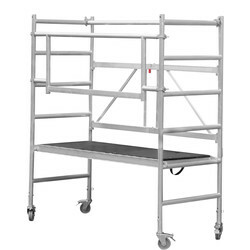 Reach required working heights safely and securely with access towers and platforms. At Toolstation, we supply access towers from quality brands, including Werner. The Werner mobile access tower is ideal for working safely at various heights. It is ideally suited to a range of functionalities, including maintenance, decorating and construction work. The Werner branded mobile access tower is popular product in industrial trade due to its trusted reliability and long-lasting durability. The light weight of this access tower means it is easily portable. 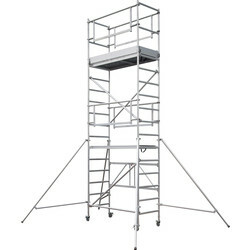 This handy mobile access tower has a modular system to construct up to three working levels with extension packs. The Werner mobile access tower is well-suited for those working at heights for long periods of time. 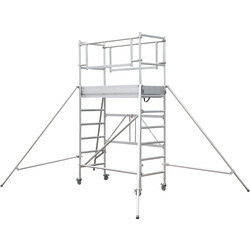 This access tower has a compact base pack which is simple to maneuver and can easily fit through doorways. For added safety precautions, purchase the stabilisers from extension pack 2. Reach up to a secure working height of 3.8m with extension pack 3. 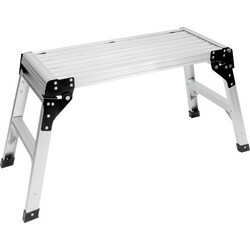 Browse our range of Werner access towers and extension packs online at Toolstation.